Time for my latest prediction of the election result. I’ve narrowed the gap between Labour and the Conservatives from what I suggested this time last month. I’ve also, once again, revised the number of Liberal Democrats seats downwards slightly, and made adjustments to the totals for the SNP and Ukip. Labour’s total of 289 is up 31 on its result in 2010. It includes Corby, which the party won in a by-election in 2012, and Bradford West, which I’m now predicting Labour will retake from George Galloway. But I’ve knocked a few seats off Labour’s total to reflect the likely impact of an increased Green vote in several Tory marginals. Examples of this include Brighton Kemptown and Hove: two seats that are top Labour targets, but which look increasingly like remaining in Tory hands thanks to a split in the left-wing vote. The Conservatives’ total of 277 is down 29 on what they got in 2010, and doesn’t include the seat of the Speaker John Bercow. He is counted within the figure for “others”, which also includes Caroline Lucas holding her seat for the Greens in Brighton Pavilion, Plaid Cymru keeping its three seats, the 18 constituencies in Northern Ireland, and two seats for Ukip. One of those will almost certainly be Douglas Carswell in Clacton. I now think Ukip will win a second seat, and one currently held by the Tories. My instinct at the moment is this will be Boston & Skegness, though I’m far from certain. I’ve increased my prediction for the SNP. This month I’ve put them on a total of 31 seats, which represents an increase of 25 on 2010. I’ve handed them eight gains from the Liberal Democrats and 17 from Labour. I know this is below what recent polls have been implying, but as I mentioned a few days ago, I’m waiting to see sustained evidence of a surge before stating confidently that the SNP will win over half of Labour’s current seats. For the first time in my series of monthly predictions, I’ve suggested the SNP will win more seats than the Liberal Democrats. It’s also the first time the Lib Dems have slipped below 30 MPs. No combination of two parties would add up to 326 seats: the theoretical number needed for an absolute majority in the House of Commons. The closest would be a Labour-SNP coalition, which would total 320 seats: six short. A Labour-Lib Dem coalition would total 317, while a Tory-Lib Dem coalition would come to 305. Some sort of grand coalition, or multi-party agreement, would be another alternative. 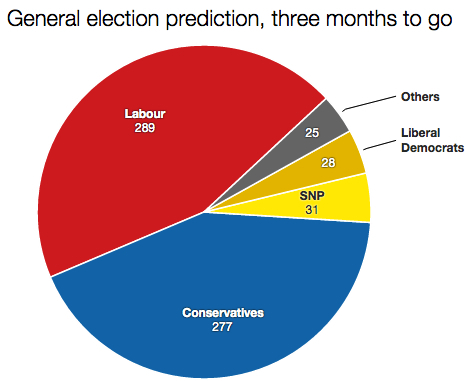 Based on my prediction, Labour + Lib Dem + SNP would equal 348, while Labour + SNP + Plaid Cymru + SDLP would equal 326. I can’t see how the Conservatives would be able to put together enough support to reach even 326. The closest they’d get would be Tories + Lib Dems + DUP, which equals 313. From the Lib Dems: Solihull, Dorset Mid & Poole North, Wells, St Austell & Newquay, Somerton & Frome, Chippenham, Berwick-upon-Tweed, Cornwall North, Portsmouth South, St Ives and Taunton Deane. From Labour: Ochil & South Perthshire, Inverclyde, Dundee West, Falkirk, Aberdeen North, North Ayrshire & Arran, Airdrie & Shotts, Glasgow East, Livingston, Edinburgh East, Midlothian, Linlithgow & East Falkirk, Glasgow South, Glasgow North, Glasgow Central, Glasgow North West and Dunbartonshire West (total = 17). From the Conservatives: Clacton and Boston & Skegness. The gains are compared with the 2010 result. You’re right to spot the inconsistency, though! I’ve removed Bradford West from my list of Labour “gains”. Oh, 320 is pretty close, taking account of Sinn Fein’s absence. Add on the Green(s) and PC and you might get a broad “left” government. More likely a Labour minority (with confidenece and supply) than a formal coalition.